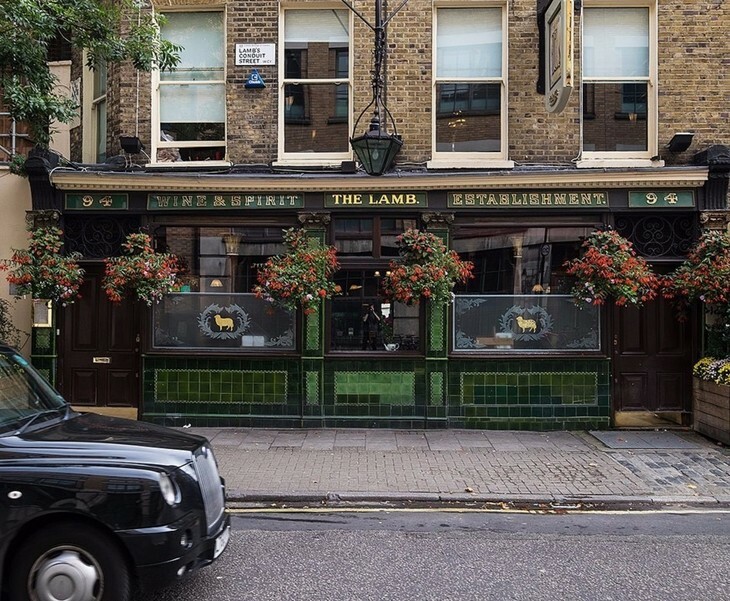 Writer and tour guide Robert Kingham — one half of Minimum Labyrinth — has spent too long in the pubs of WC1, taking in parts of Bloomsbury, St Pancras, Clerkenwell and Holborn. 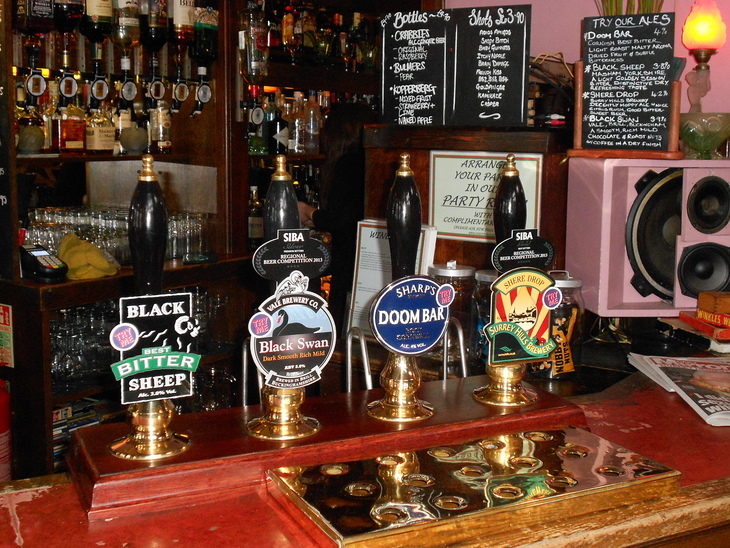 Here, he picks 10 pubs worth a visit, with some local factlets to edutain your friends with. Like a pair of undiscardable slippers, there is something immensely comforting about the brindle-stained tartan carpet, the languid oranges and browns, and the heavy furniture with dark varnished corners smoothed away to bare wood, that are offered by a Victorian pub. The Calthorpe Arms pretends to be nothing more. Sat on an outside bench, you can look across Gray's Inn Road to the unashamed 1930s mock-medieval façade of the London Welsh Centre. For centuries, the Welsh that came to London became twice as Welsh as the families they left behind, their national pride (and hunger to forge a distinctive culture) sharpened by a keen sense of hiraeth. ...the eternal beauty hidden beneath the crust of common and commonplace things; hidden and yet burning and glowing continually if you care to look with purged eyes. Machen was my starting point for exploring these grey purlieus. "He who cannot find wonder, mystery, awe, the sense of a new world and an undiscovered realm in the places by the Gray's Inn Road, will never find those secrets elsewhere." I have tried not to bore you with the famous WC1 pubs, such as the Princess Louise and the Museum Tavern, but I do have a soft spot for the Cittie of Yorke, in which we stopped on the first walk I led in 2006. I do enjoy most Samuel Smith pubs in London (which Londonist wrote about in 2017), mainly because they are among the most historic. The beer prices add to the illusion that you have stepped through the door and back in time. Many now have designated outside swearing areas. 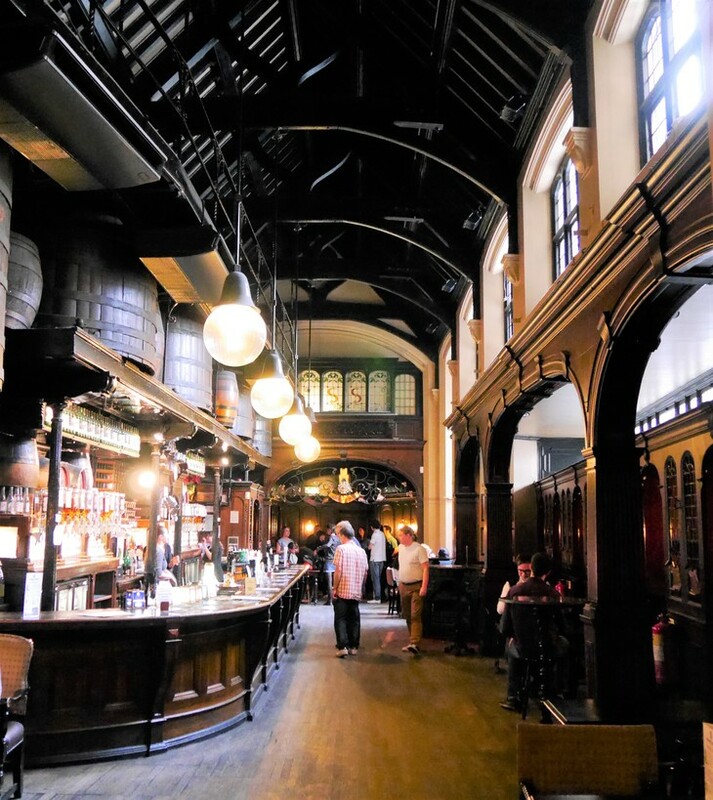 The Cittie of Yorke is the more charming for being entirely a confection of the 1920s that captures that inter-war yearning to turn back the clock to an indeterminate Olde England. The tight little cubicles are ideal for sordid trysts. Turn left out of the pub and walk down High Holborn towards Chancery Lane station. On your right, the mock-medieval of the Cittie of Yorke gives way to the genuine Tudor of Staple Inn. Cross over Gray's Inn Road and enjoy the frisson of pleasure as High Holborn suddenly becomes Holborn. Only sensitive people will feel this. When you reach the edge of the terracotta tiramisu of Waterhouse's Prudential Assurance Building, turn left into Brooke Street. Like many, I was drawn to Brooke Market by Peter Ackroyd, who marks it out in London: The Biography as a place of silence which one comes upon unexpectedly after the close thunder of Holborn. Here is the hemmed-in church of St Alban the Martyr, with many pockets of beauty to be explored, once you have been greeted by the impelling, imploring statue of Christ bursting from the wall. It seems unfair to pick one from these two pubs, across the street from each other, especially as one is sometimes open when the other is closed. 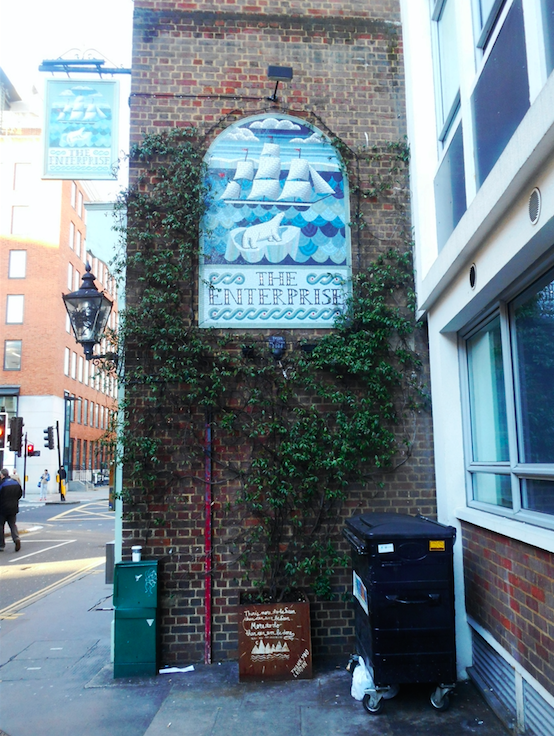 The Dolphin Tavern has its famous clock, its hands frozen in time by the German bomb that destroyed the pub in 1915. The Enterprise is a Victorian pub that has been photo-edited: contrast turned up, brass made shinier, dark walls made darker. Come out of either pub (or both) and you cannot help but be enticed down the diagonal alley, Lamb’s Conduit Passage, which takes you to Red Lion Square. The square is one of the least peaceful of London squares, the west side of it now forming the A4200. It originally had four diagonal roads coming off it in a saltire: as well as Lamb's Conduit Passage, there is still Fisher Street to the south-west, whose anonymous arse-ends of architecture frame an arresting view of the Edwardian Baroque of Carlisle House. The road to the south-east was lost to the Luftwaffe. If you stand on Southampton Row, the outline of the lost road to the north-west can just be discerned in the diagonal join between the Cochrane Theatre and the old Central Saint Martins building, giving the impression that the buildings have clashed together like the Symplegades of the Bosphorus. Red Lion Square was developed in in 1684 by Dr Nicholas Barbon, whose full name was Nicholas Unless-Jesus-Christ-Had-Died-For-Thee-Thou-Hadst-Been-Damned Barbon. The best way to encounter this pub is by chancing upon it on a misty night. Upon pushing open its doors you will be weighed down by a heavy sensation of having stepped into the 1940s. You will meet someone's gaze and try to resist falling in love. Haunted by their dark eyes, with feelings stirred that you thought long-dead, you will vow to return and allow yourself one moment of happiness. But the next day, the pub is gone and the street cannot be found, and thus begins your descent into madness. The Duke is regularly used as a film set and there is something unreal about the whole territory. Roger Street bends and narrows into Doughty Mews, surely one of the most beautiful mews in London, with architectural irregularity to match a Flemish terrace. It is home to the Egypt Exploration Society, and conjures up for me more than anywhere else the vision that Arthur Machen had in the 1920s, when he caught a glimpse of a little coach-house and stables, and suddenly, like a revenant, beheld the dimly-lit city of 1840. It is no surprise that Doughty Street, parallel to Doughty Mews, was one of the (many) homes of Charles Dickens, who appears to have moved house every time he finished a paragraph. Before you leave The Duke, do venture into the basement bar, which has the air of a Twin Peaks roadhouse about it. A much more well-known pub, worth a trip in its own right for its snob screens and its dark wooden melancholy. It is surrounded by a legacy of compassion for children: to the north, the remnants of Captain Thomas Coram's Foundling Hospital, now a children's park. In the niche, mothers would leave their babies in a basket, ring a bell and walk away. Opposite is the Octav Botnar Wing of Great Ormond Street Hospital, with what looks like a hallucinogenic climbing wall up one side of its atrium. And to the west is the main body of the Hospital itself, with its statue of Peter Pan hidden in the tiny courtyard next to the main entrance. This is a reminder of the philanthropy of J.M. Barrie, who like Arthur Machen, came penniless to London in the 1880s to make it as a journalist. Machen (less commercially successful than Barrie) also wrote of Pan — but a very different Pan. McGlynn's rivals the Calthorpe Arms for its crumpled, faded welcome, but it is more of a threadbare dressing gown than a pair of slippers. Sit on the benches outside and meditate on the black-doored little workshop opposite, with its hand-painted sign still bearing the 1960s telephone exchange prefix (TER is for TERminus, for we are very close to King's Cross and St Pancras stations). A few doors down is the mesmerising 6 and 6A Whidborne Street, a narrow three-storey house standing all alone like a solitary tooth after its neighbours on the corner of Argyle Street were knocked out by the Luftwaffe. There's something shiny and brisk about The Queen's Head, with its sparkling tiles and Victorian fairground-carousel façade. It is the single splash of colour in Acton Street, like a fashion shot where the model's dress is vivid blue against a Photoshop-greyed cityscape. Turn left out of the pub and you can see the modest rise of Great Percy Street in the distance. At the top is Percy Circus, and if you look back from here you can see more clearly the contour of the Fleet valley running silently beneath King's Cross Road. ...there is hardly anybody about... there are no shops here to draw people; there is a deep, leafy silence... there are short flights of steps which lead to mysterious alleys or passages or byways going to nowhere in particular; here, too, you shall find unexpected ash groves and sweet quivering poplars and little houses strangely tucked away. In half an hour's walk I saw neither taxi nor car of any sort; for the storms of our age do not beat upon this place. The storms of other ages did beat upon this place. It was at 30 Holford Square (to the north of the Circus and destroyed in the Blitz) that the butterfly's wings first beat. In 1902, a man took lodgings there under the name of Jacob Richter. He was a man in his thirties, balding with a goatee beard, who walked every day from here to Clerkenwell Green to edit an underground revolutionary journal entitled Iskra, 'The Spark'. Richter was a pseudonym, of course; his real name was Vladimir Ilyich Oulianoff, and his more famous pseudonym was Lenin. He and his comrades booked a room above the (now lost) Crown and Woolpack, on St John Street, under names such as 'The Foreign Barbers of London Association'. There was an inspired moment of policework when a Detective Inspector Herbert Fitch of Scotland Yard was ordered by his superintendent to hide in the cupboard in the room where they met, but couldn't report back because — he explained — "the meeting was in Russian". Doesnt it make you uncomfortable when pubs havent put apostrophes on their signs? This is indeed a larder belonging to a queen. Queen Square was named after Queen Anne but the statue in the leafy square is of Queen Charlotte. 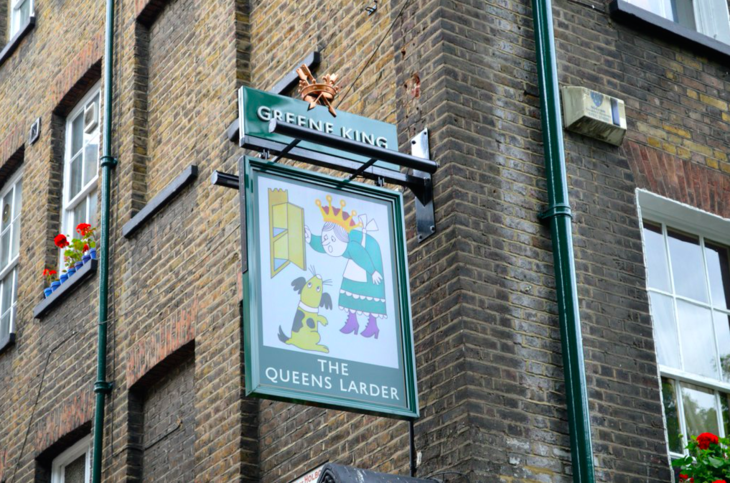 Her husband, King George III, was treated for his madness here — an invigorating course of cold baths, severe restraint, beatings, and starvation — and apparently Queen Charlotte rented the cellar of the pub where his favourite food could be prepared for him. ...comely brick houses set apart for the humanities of life and alleviation of all hard destinies. As you go round it, you read, upon every second door plate, some offer of help to the afflicted. There are hospitals for sick children… There is something grave and kindly about the aspect of the Square that does not belie the grave and kindly character of what goes on there day by day. 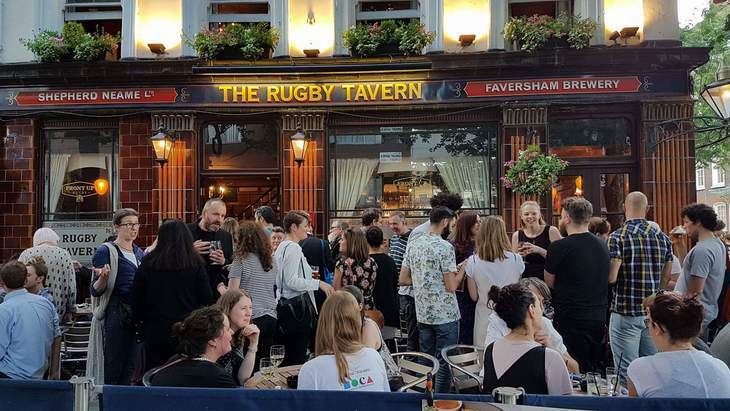 The Rugby Tavern is another pub best stumbled upon in a pea-soup fog. In its setting it has an imaginary quality. It sits at a staggered junction that has been paved into a leaf-canopied square that now separates two corners formed by four streets: Rugby, Millman, Northington and Great James. At 15 Great James Street lived Theodore Watts-Dunton, solicitor, minor poet, and follower of the Pre-Raphaelites. One day he called on his neighbour at number 3 to introduce himself. His neighbour chased him onto the street stark bollock naked. They became friends. His neighbour was another poet: Algernon Charles Swinburne. 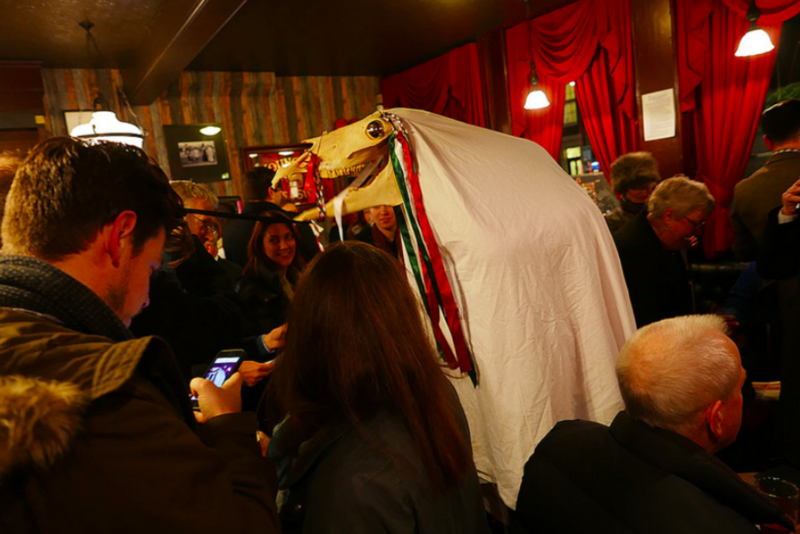 With your absinthe in one hand, a copy of Swinburne’s poetry in the other, and an enormous ginger wig on your head to complete the effect, you can sit watching the taxis swing round the twin corners, while lamenting the triumph of Christianity and the ensuing loss of pagan beauty. Thou hast conquered, O pale Galilean; the world has grown grey from thy breath; / We have drunken of things Lethean, and fed on the fullness of death. Or, like Shaun of the Dead, you may prefer to have a nice cold pint of Shepherd Neame, and wait for this all to blow over. 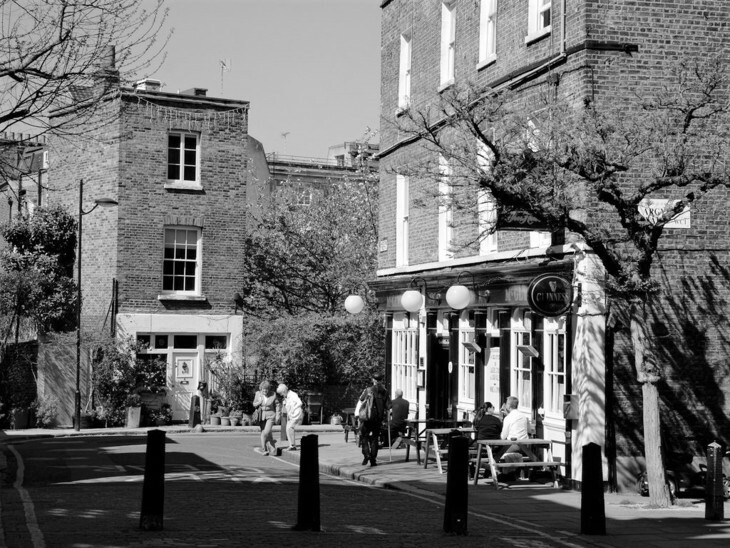 The Union Tavern nestles at the foot of Lloyd Baker Street, up which 'the pedimented pairs' of houses 'dutifully climb… two by two'. Arthur Machen called these streets 'decorous, but hideous in the extreme'. Like me, you may disagree with him: the late Georgian villas are unusual and gorgeous, and you may recognise them as the location for George Smiley's house in the 2011 film of Tinker Tailor Soldier Spy. Ignore Lloyd Baker Street (for now) and turn right out of the pub up King's Cross Road. Under the frowning concrete arches of the Travelodge runs the stumpy Gwynne Place. The steps gained minor literary fame in 1923 as the setting for Riceyman Steps, Arnold Bennett's novel about a miserly bookseller who marries the widow across the street. They starve to death, despite the gold coins in the safe. At the top of the steps is revealed Granville Square, surely the most carefully-concealed of London squares, named after Granville Sharpe, the anti-slavery campaigner. Randell's Tile Kilns stood here and extracted a vast amount of clay, leading to this sharp difference in levels. You may notice that the architecture is different on the west side of the square, because these houses sit directly over the Metropolitan Railway and were rebuilt after the cut and cover took place. The join is visible. Minimum Labyrinth's The Pantheon of Pancras runs until 3 November 2018 and bookings are now being taken for The Thin Veil of London in spring 2019.